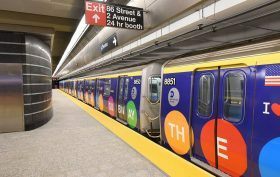 The second phase of the Second Avenue Subway passed its environmental assessment, putting the Metropolitan Transportation Authority one step closer to bringing more subway service to East Harlem. 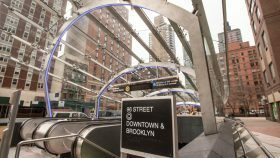 The agency announced on Monday that with the Federal Transit Administration issuing the project a “Finding of No Significant Impact,” the MTA can now secure federal funding for phase two. 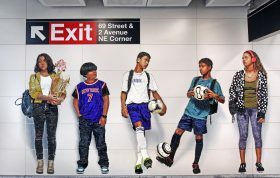 In this phase, the Q line will extend from its terminus at 96th Street north to 125th Street, moving west to Lexington and Park Avenues, where the line will connect with the 4, 5, 6, and Metro-North trains. For over a decade, a large swath of the Upper East Side was under construction, but for many residents, it felt more like being under attack. As the Q Line was being built—after a century-long wait—the neighborhood not only had to tolerate restricted traffic along Second Avenue above ground but also more dramatic interruptions. Indeed, at one point in the subway line’s construction, underground explosions even shattered the windows of several local businesses. 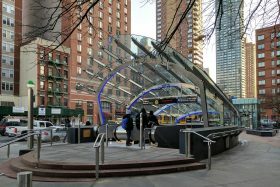 But with the noise, traffic, and disarray of the Second Avenue Subway in the past, the surrounding neighborhood has already quickly bounced back. As per predictions, since the completion of the line, real estate values, volume of sales, and rental prices in Yorkville have experienced an upswing. According to new documents, the next leg of the extension of the Q line to 125th Street that comprises the second phase of the Second Avenue Subway will be done in 2029, the Daily News reports. And that completion date only holds if work is begun on time, in mid-2019, according to the same document from the Metropolitan Transportation Authority and the Federal Transit Administration. The expected phase two completion date is nearly a decade after Governor Andrew Cuomo opened the first section of the project in 2017. That 2029 date refers to the time all construction equipment has left the site; MTA officials hope to begin running trains through the tunnels, bringing vital service to Harlem, in 2027. The MTA has released updated ridership figures for 2017, giving an even better look at how the Second Avenue Subway is growing in popularity and impacting the Lexington Avenue line. By looking at the three comparative stations–96th Street, 86th, and 77th/72nd Streets–we can see that average weekday ridership on the 4,5,6 line has dropped 29.5, 29.2, and 23.6 percent respectively. More impressive is the fact that in 2017, the annual number of riders at the 96th Street station and 77th and 72nd Street stations were almost identical on both lines at roughly 8.5 million. And at 86th Street, the Q station hit 7.7 million riders, still impressive compared to the Lexington line’s $14 million considering there are two express trains there, too. On Valentine’s Day, The Source, a long-running store on Third Avenue that sold everything from stationary and household cleaning products to cards and candles, closed its doors for good. Since early January, when the owner hung a going-out-of-business sign in his window, he had been telling Upper East Siders shoppers that he was shutting down for two reasons: rising rents but the drastic decline in business brought about by the Second Avenue Subway’s opening in January 2017. Although one might assume that a business like The Source is really a victim of Amazon and the rise of other online retailers, the increasing vacancy rates along Third and Lexington Avenues on the Upper East Side over the past year appear to confirm his speculation. As much as the Second Avenue Subway has been good news for businesses in Yorkville, its opening seems to have dealt a devastating blow to businesses located just west of the new line. Why do transit projects in NYC cost more than anywhere else in the world? Even as the Metropolitan Transportation Authority has cut costs on basic maintenance, they have allowed trade unions, construction companies and consulting firms to negotiate exorbitant deals on transit projects, with little intervention from officials. According to an investigation by the New York Times, labor unions have secured deals requiring construction sites be staffed as many as four times more workers than anywhere else in the world. 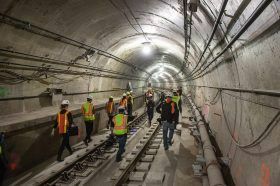 Construction companies have increased their projected costs by up to 50 percent when bidding for work from the MTA and consulting firms have convinced the authority to spend an excessive amount on design and management. Caught up in the bureaucracy of the industry, neither public officials nor the authority have attempted to contain the spending. Why are the Second Avenue Subway’s newsstands still empty? TodWhen the city first got a look inside the new Second Avenue Subway stations ahead of the line’s New Year’s Day 2017 opening, one of the shiniest, most colorful elements was the collection of newsstands. Ten months later, however, the kiosks still sit empty, decked out in the signature marketing of rainbow polka dots. According to the New York Times, the MTA says it’s selected an operator for the newsstands, and though they won’t reveal who, claim that they’ll open soon. 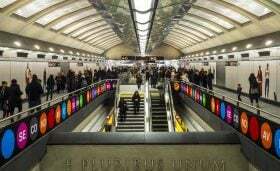 But is the fact that Q train riders seem overwhelmingly unaware and unaffected by the lack of newsstands a sign that they’re not actually wanted or needed in a time when newspapers and magazines have been replaced by tablets and iPhones and candy and sodas with organic oatmeal and Juice Press? 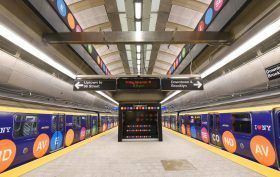 When the Second Avenue Subway opened this past New Year’s Day, it was nothing short of a miracle. Not only had the $4 billion infrastructure project been 100 years in the making but in the months leading up to its deadline, there was much talk about delays related to the system’s “rigorous testing schedule” not being met. As it turns out, the testing wasn’t met; the Times tells us that when the train opened on January 1st, “the fire alarm system was still being tested and more than 17,000 defects found during inspections had not been fixed.” And eight months later, the train is still operating under a temporary safety certificate.